aearwen2 has her birthday today and I'm determined to celebrate it in style. So, for one of my favorite musicians and a dear person who has become a treasured friend over the past few months, I offer the following picture. 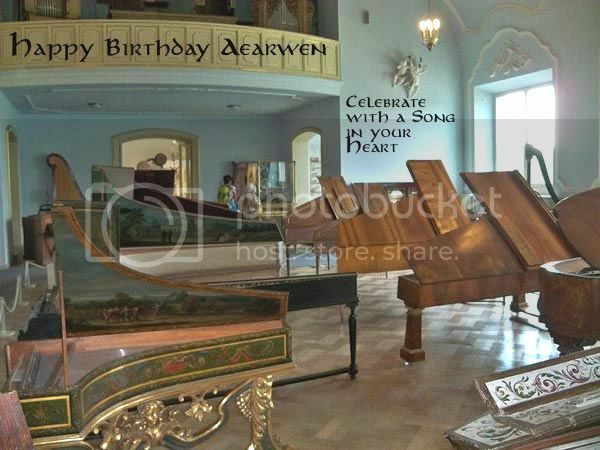 My cousin recently went to Germany and in her travels visited the Deutsch Museum in Munich where she found this fabulous room of old harpsichords (and a harp sticking out in the background). I couldn't think of a better photo to celebrate your birthday! Oh, this is delightful! I'd be wanting to try each and every one of them out!! Yes, my turn tomorrow. Looking forward to it. Thanks so much. Love this!